This entry was posted in 1. 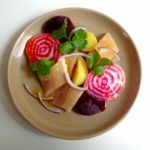 Starters and tagged beets, potatoes, recette, recipe, smoked herring. Bookmark the permalink. In the US smoked herring (and smoked trout) can be purchased … where else? … at Trader Joe’s. Lovely recipe, and a great idea for a starter or light meal. in your opinion, are they the same or very similar? Thanks for your great newsletter!